Part of running a successful bakery depends on having the best equipment for the job. 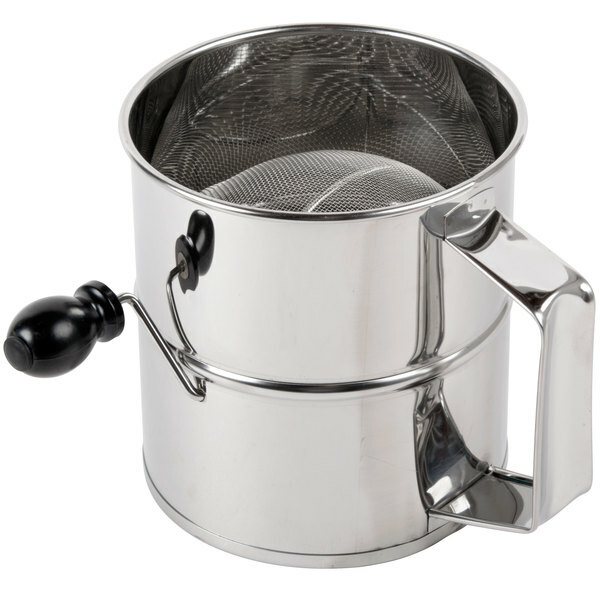 This flour sifter is made of 18-8 stainless steel with a highly polished body, handle and 16-mesh screen. 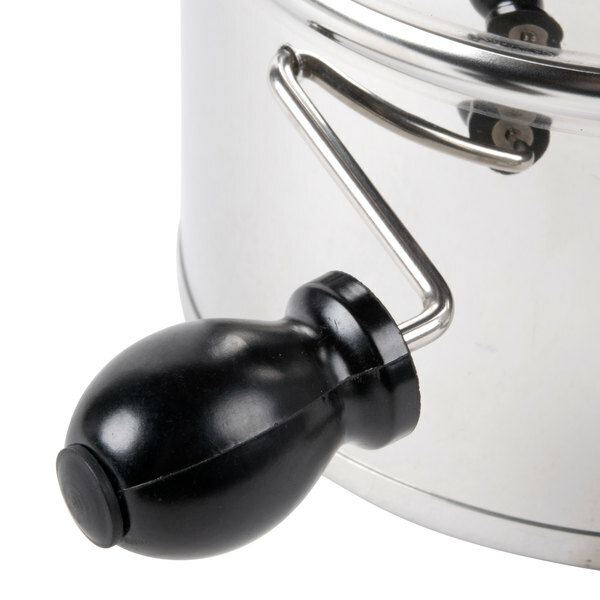 Thanks to a rotary design, this product is easier to use compared to other squeeze handle sifters. Sifted flour is lighter, making it easier to mix into other ingredients. This is important when making cake better or dough. Mixing sifted flour with other dry ingredients, such as coco powder, allows for even mixing before combining with other ingredients. Not only can this sifter sift flour, but it's also perfect for sifting powdered sugar over baked goods like funnel cakes. An eight cup capacity ensures that you'll have enough flour or powdered sugar to get the job done in less time. 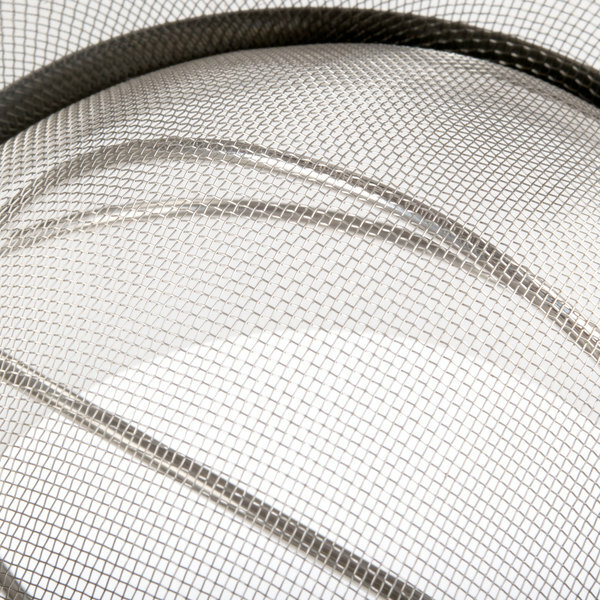 The beater is chrome-plated with wire reinforcement on the bottom. I bought this to make french Macarons and to sift a mixture of almond flour and powdered sugar. During my first use, the handle came completely off along with the two tiny washers that fell to the floor. I tried to put it back on but it does not screw in, I don’t think that it even screws in. The large size is nice but the handle is also large and could be made smaller to get more of a grip, not thinner and wider. Quite disappointed on this item. Hard to purchase online but haven’t found this size of a sifter in stores. I purchased two of the sifters for my new bakery and the first time I used each of them the handles came completely off. I thought I could maybe use them without the handles but now I can barely turn the sifter. I would not recommend this product! Thank you for your review, Lisa ! We are sorry this 8 Cup Stainless Steel Rotary Flour Sifter has not worked well for you. A Customer Solutions Representative will contact you soon! 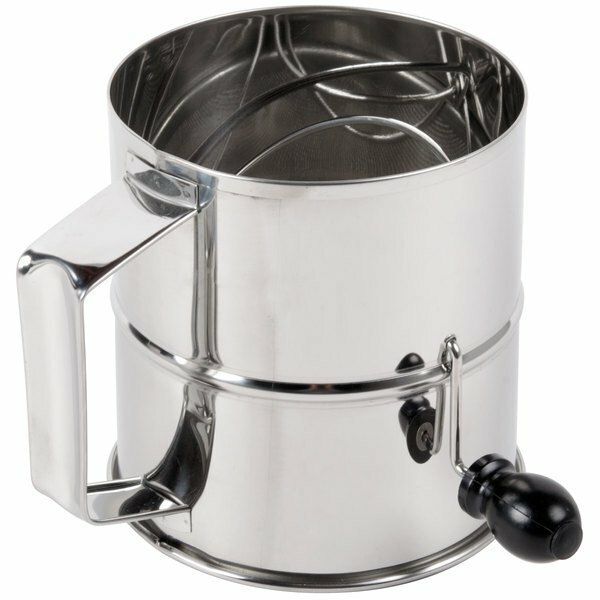 We really like this 8 cup stainless steel rotary flower sifter, is makes our job much easier. We use it to coat our product in powdered sugar and it works really well. 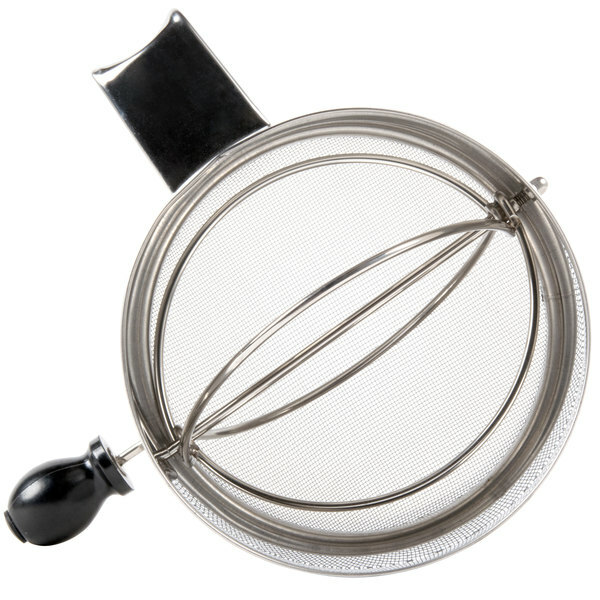 The high capacity of this sifter makes it very convenient. I can measure a double or triple recipe of dry ingredients into this sifter. It is easy to use and to clean. The one drawback for me is that before I have emptied it, my hands are in pain, which doesn't happen with the sifters that have an arm to turn. I really enjoy using this product, worth every cent. No more clouds of flour in the kitchen., no more shaking my hands holding a sieve. I actually enjoy sifting any dry ingredients! I find the handle can be a little hard to turn, I imagine it will loosen up with more use. I do like that it's easily disassembled for cleaning. I was excited to use the larger a cup flour sifter, however the quality is just not there on this one. The flour clogs when trying to sift it and the little black handle falls off constantly. Thank you for your review, Amber! We are sorry this 8 Cup Stainless Steel Rotary Flour Sifter has not worked well for you. A Customer Solutions Representative will contact you soon! Worked very well for about 6-7 months of weekly use. The plastic handle did screw off and eventually I just replaced the sifter with a different one. Got good use out of it. We appreciate your feedback! We’re sorry this product didn't hold up. If you are looking for a new unit, please feel free to reach out to our Customer Solutions team for assistance. This is my second purchase. I gifted a friend with one. I saw this product in a retail store for twice the amount. I love it! 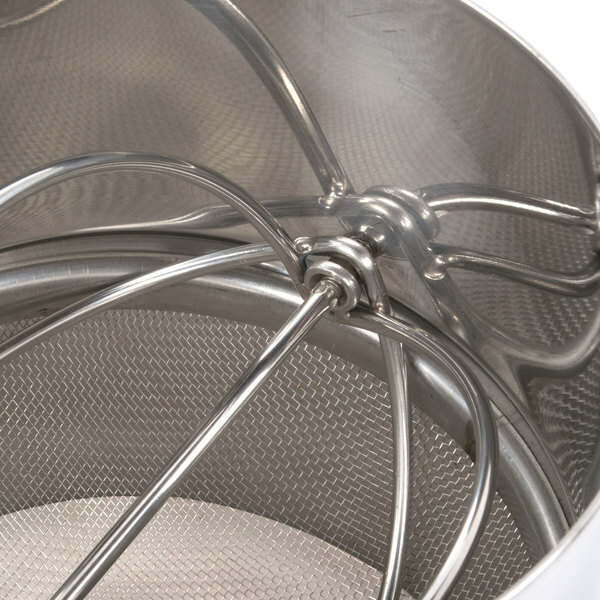 A flour sifter is great for baking and ensuring even mixing of your dry flours, etc. This device holds quite a bit and uses a rotary to ensure even coverage and that all flour gets sifted. I really wanted to like this product, but it is not very high quality. I am not sure if I even have it anymore because it just doesn't work well. I should have opted for a more durable product. If you are using it for home use then you might like it, but not for commercial use. Flour sifter works well and makes the job much easier. The machine has held up for a while and keeps working day after day. Very useful. We really enjoy the large capacity. Flour goes through more quicker especially with double the amount of beater. Good stainless steel quality. We put it in our commercial washer and it seems to be holding up well. This is a nice sized sifter. Works great, we love the rotary styled sifters. Though the knob came off pretty easily and we couldn't get it back on, but it still works. Nice big sifter. We use for sifting and sprinkling powdered sugar. One drawback we have found that it gets beat up in the dishwasher so we wash ours by hand. Doesn't quite fit the 8 cups it advertises (more like 7), but it is a good flour sifter. I like the handle on the side. If you hand make a lot of fried foods then you will often need to sift your flour. This does the trick in small quantities.